Soldiers Michael Futch and Logan Remillard registered for a job fair in Utah in November. NEW YORK (CNNMoney) -- More veterans are coming back from war and getting back to work in the civilian job force, thanks to efforts by both employers and the government, as well as the improving economy. Nearly half of the 170 employees at Halfaker and Associates are veterans, and 10% of them are disabled. Some firms have formal military recruiting programs, and others are creating or expanding them. This week Disney (DIS, Fortune 500) announced "Heroes Work Here," a program it says will recruit 1,000 vets over the next three years. The government wants to encourage more efforts like this. "This past year saw the passage of a number of bills specifically designed to support veteran hiring and training," said Adriana Kugler, chief economist for the U.S. Department of Labor, which produces the BLS statistics. Kugler cites the Returning Heroes and Wounded Warriors tax credits, both of which went into effect in November. Returning Heroes provides a credit of up to $2,400 to employers who hire a vet who's been unemployed for at least four weeks. It was expanded to give $5,600 to employers who hire veterans who've been jobless for over six months. The Wounded Warrior tax credit is worth up to $4,800 for companies who hire disabled veterans. This credit was doubled in November for the long-term unemployed, giving a tax break of up to $9,600 to companies that hire disabled veterans who've been unemployed longer than six months. There are other efforts in the works. President Obama has proposed the Veterans Job Corps initiative, which calls for $1 billion to hire 20,000 vets over the next five years to work in jobs related to environmental protection and maintaining roads and levees. He's also proposed a $5 billion program to hire police officers and firefighters that would give priority to veterans. Savvy job-seeking veterans are aware of the tax breaks that are already on the books, and they don't hesitate to tout them in interviews. "We've had a couple of candidates say, 'Hey, if you hire me, you'll get a tax credit,'" said Holly Mosack, chief recruiter at Advanced Technology Services in Peoria, Ill.
Mosack, a former Army captain and a veteran of the Iraq war, said 30% of her company's 3,000 employees are veterans, many of whom are placed in machine jobs at factories. ATS takes advantage of incentives from the state of Illinois, but not the federal government. Mosack says that the credits are unwieldy for employers, and her company is trying to figure out how to improve the process. "They always tout these incentives, but they don't explain how to implement them," she said. "For us, to get a tax incentive is nice, but it's nothing that would change our hiring practices." 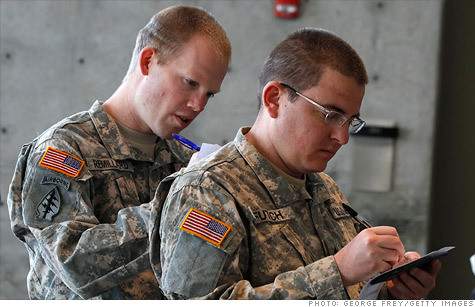 Military vets: MBA dream candidates?